The APEST assessment is a profiling instrument designed to assist you in finding your ministry style in relation to the philosophy of the fivefold ministry of Ephesians 4 (Apostles, Prophets, Evangelists, Shepherds, Teachers). It has emerged from over 10 years of practical application of this model in various ministry contexts. The APEST--both Personal and 360 versions--was written originally in 2008 and 2009. The current deployment of the APEST was developed in collaboration by Alan Hirsch, Jeff Weber and Jonathan Reitz. The APEST Assessment is a reliable test that measures your behavior against the FiveFold Ministry standards found in Ephesians 4. PUT ANOTHER WAY... APEST is an online, formative, self-assessment is designed to solicit an individual response to a series of questions. APEST is a subjective assessment, offering questions that may solicit more than one applicable answer. APEST measures an individual’s current ministry motivation and expression in ministry settings. As a result, APEST leads one to new areas of learning and integration for increased ministry engagement. APEST provides a quantified result to identify one’s current place for influence within a larger community. Ministry vocation is a mixture of personal identity, God’s calling, the Spirit’s gifting, and community discernment. We only really know ourselves and our ministry impact in relation to others. So we believe that the best way to know your ministry is to somehow assess its impact on people around about you. So while you can easily do the individual profile, we really recommend that you consider doing the 360 degree test as well. This is a great tool for communities and leadership teams as a whole as it will allow you to ensure that you have a more complete ministry mix necessary to be missional church. The APEST material originated in the writings of Paul. For there to be movement or growth in any context, a team should draw upon the natural energy and momentum inherent in each member. Every person functions in unique ways. It is remarkable when a group allows each member to function out of their natural capacities, thus contributing to the overall movement, direction, and wisdom of a team. APEST™ is designed to help people identify their natural, ministry motivation and expression in a given situation. Take the APEST Vocational Assessment and learn your area of motivation and expression of the 5 fold model of ministry. This test costs $10 USD. You'll purchase the test through the link below, and then be re-directed back to this site to take the test. Click here to purchase the APEST Personal Vocational Assessment. The first step in the APEST 360 Vocational Assessment is taking the APEST for yourself. Then you choose 5 - 10 colleagues to take APEST ON YOUR BEHALF (they will not be taking it for themselves). You will get two sets of scores: your individual score and the 360 aggregated from your invited colleagues. You can therefore compare your self-perception with the community’s experience of your ministry and influence. This test costs $25 USD. Click here to purchase the APEST 360 Vocational Assessment. Click or hover over a book to purchase or for more details. Read an excerpt from The Forgotten Ways by Alan Hirsch, the book from which the APEST assessment is taken. 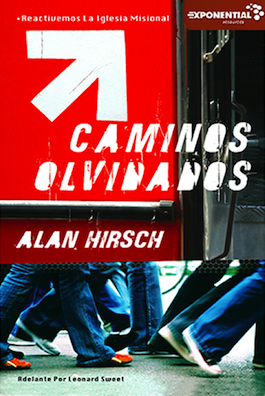 Descargar una traducción libre en español de "Los Caminos Olvidados" aquí! For a more in depth description of the APEST philosophy and thinking, read this article by Alan Hirsch from Leadership Journal.